Ali Land spins sentences and characters that punch you in the gut. 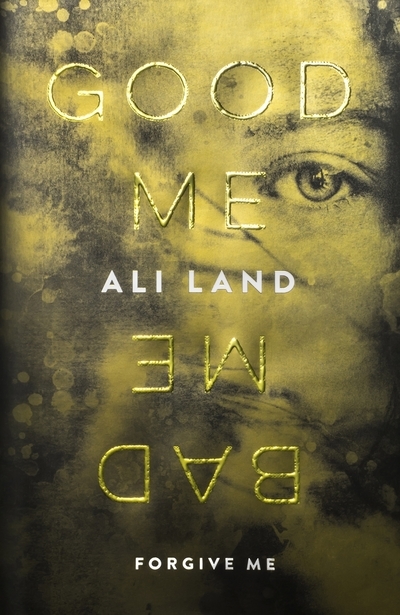 I read and reviewed her debut novel, Good Me, Bad Me earlier this year, and it remains one of my top books of the year. While her novel is a page-turner worthy of an all-nighter, it is more than a thriller. It is an intense character study that reveals the emotional nuances of the damaged, sidelined characters we often write off. Ali spoke to me a little about her writing process, and the answers are a treat for any writer or fan of the book. 1. What drew you to thriller writing as a genre? I never sat down and thought right I’m going to write a thriller. For me, Milly came first, her voice and her story. My editor and I often talk about how the book doesn’t fit neatly into the thriller genre. It’s been called a psychological drama, a character study and a YA/crossover novel. Recently it was shortlisted for the debut of the year by the Crime Writers Association which places it in the crime camp as well. My favourite kind of book to read is dark, literary and with an unusual voice or premise that urges you to discuss the book afterwards which it seems, is what I write, so there must also be something about what we read, influencing what we write. 2. Milly is a fascinating character, because while she has handed her mother over to the police and is trying to build a new life for herself, there is the sense that something is deeply wrong. As a writer, how hard was it to balance making her likeable while exploring more uncomfortable aspects of her character? Bringing Milly to life was a privilege but it was also exceptionally hard and saw me an insomniac in the writing of the first draft. My main priority was facilitating an authentic experience, one that would allow readers to inhabit the mind and body of a child who has a complex and disturbing past, and to illustrate that simply desiring to be good isn’t enough. Readers will discover that Milly is, at points, frightening, it’s how she’s been conditioned and taught to be, but she’s also a teenager trying to do her best, desperate for a chance at a fresh start, a new family. Balancing her darker side with the more favourable traits I knew readers would respond to, like when she helps a girl from her school in a traumatic situation at a party, was like walking a tightrope. It’s ok to create a character that scares readers but there has to be some redemption, something about them that compels the readers to, perhaps not root for them, but at least feel something for them, and in Milly’s case I wanted that to be compassion. When people contact me about the book and tell me I’ve achieved that, that for me is the biggest gift I could ever receive. 3. This book contains some of the most truly disturbing scenes I have come across. This must have been emotionally exhausting! How did you draw a line between your writing world and the real world? I think the decade I spent as a Child and Adolescent mental health nurse, prior to becoming a writer, held me in good stead. In order to remain balanced and be able to care for acutely traumatised children, you must draw very clearly defined personal boundaries and try very hard not to cross them, not to allow the lines to become blurred. Easier said, of course, we’re human after all. Yet, even with a high tolerance for the disturbing through my experience as a nurse the book was, at times, excruciating to write. I shed many tears at my desk and continually worried about writing about a child like Milly. Would people be able to see the good in her? But at the end of the day I believe there should be no boundaries to what we explore in the safe space of fiction. Being a writer is a privilege, it’s an opportunity to explore difficult yet intrinsic issues in our society and provoke discussions which ideally lead to understanding and forgiveness, I very much view writing as an extension of my nursing. 4. Milly's foster sister Phoebe bullies her from the start, a plotline I often found equally terrifying as Milly's flashbacks to life with her mother. What inspired you to introduce Phoebe, and write her the way you did? I write to explore, to go as deep as possible into my main character’s psyche. The people you surround them with are the key to unlocking them. I knew having a sister would feel special to Milly but I didn’t know what would happen if Phoebe wasn’t the sister Milly dreamed of. Creating Phoebe as a jealous and vindictive character and placing Milly in the heart of a family that looked perfect on paper, but behind closed doors were anything but, was an experiment. I also wanted the reader to draw parallels between Phoebe and Milly. In varying degrees, of course, both girls are products of their mother and an acutely dysfunctional home life. Both girls desire to fit in and although Phoebe is at the top of the social chain, and Milly at the bottom, they both experience loneliness. The similarities between them exist yet the bridge doesn’t. I find it fascinating when readers contact me to say they think Milly was justified in her behaviour towards Phoebe, and I’m not sure that’s something they would ever have thought they’d say prior to reading the book. Job done, I suppose?! 5. What has been the most surprising thing you have learnt through the process of publishing your debut novel? How difficult the switch is from writing a novel to then having to talk about it at events and in interviews. Writing is a solitary process and so much of ourselves and others in our lives bleed into our work so having to dissect that, and the motivations behind it, publicly, is a very daunting and exposing process. Writers, more than ever, are required to be public figures and it’s vital that a healthy balance between time in and time away from the spotlight is achieved otherwise the ability to fully focus and create purely and from the deepest part of yourself is at risk of being lost. Ali Land will be touring South Africa for a short time next week. You can find the details for all her events here. She will also be participating in several fascinating discussions at the Open Book Festival, details of which you can find here. Good Me, Bad Me has just been published in paperback, and is available from all leading bookstores. Believe me, you're going to want to get this one!